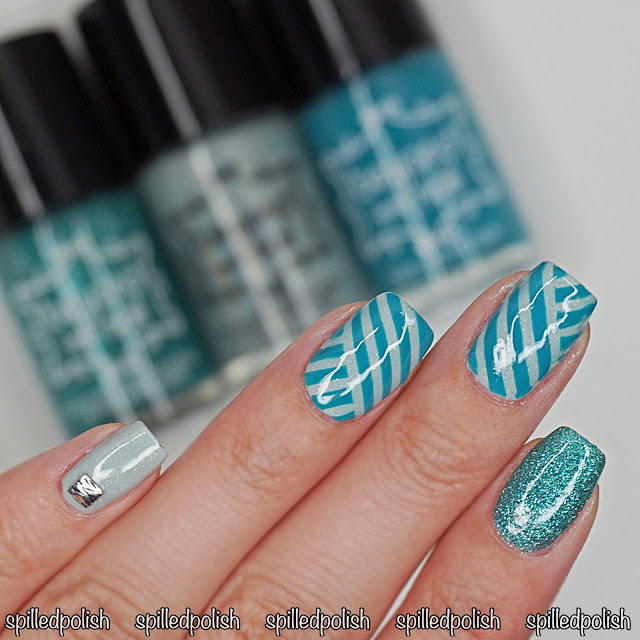 It's day 12 of The 31 Day Nail Art Challenge and today's challenge is Stripe Nails! I was inspired by this adorable mani from @Twi_Star. I started by painting my index finger with three thin coats of Beyond the Nail - Mint Microglitter. I painted the rest of my nails with two coats of Beyond the Nail - Mojito. When everything was dry, I placed on some thin Line Nail Guides diagonally across half my nail on my middle and ring fingers, then placed more in another direction on the lower and top halves of my nails. I painted over it with Beyond the Nail - Teal Creme and immediately removed the nail guides to get those crisp lines! I topped everything off with one coat of PRO-FX - Quick Dry Topcoat and stuck on a Textured Nail Stud to my pinky.